Can you describe Robb Report magazine? Who is it for and what does it cover? Robb Report was established more than 40 years ago in the US by Robert White, a collector of Civil War relics and vintage Rolls-Royce cars. The intention was for the magazine to become a forum for people to share their passion for the heritage and craftsmanship of their favourite things. Over the decades, that increasingly translated to new, upper-luxury products and experiences; largely because it’s at that end of the market where one finds things with heirloom value, or an emotional story to tell. 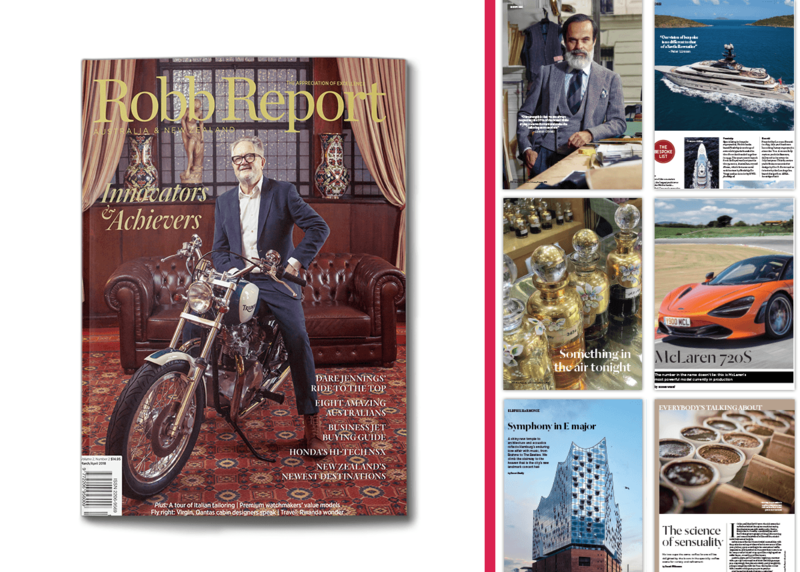 Whether it’s watches, fine cars, bespoke furniture, a seven-seat private submarine for one’s superyacht or whatever, Robb Report has been the go-to source for information. But those products don’t earn their place in our magazine or on our website solely through having a big price tag; the price is more usually the consequence of a fascinating story of design, craftsmanship, brand heritage, superior materials and techniques – and it’s all of that, that Robb Report reveals and celebrates. One great example often comes to mind: we once ran a story on the making of Aceto Balsamico Tradizionale – authentic balsamic vinegar. I personally don’t like vinegar, but there is so much passion and knowledge and romance in the making of the authentic ABT, my learning about it still makes me smile. Maybe the short answer is: Robb Report is for the connoisseur, and the curious. What’s the best part of being the editor of Robb Report magazine? What trends are you forecasting in the world of luxury for 2018? We carried a story last year by Susan Skelly, on the rise of Generation Z (basically, today’s under-20s) as luxury consumers. By 2020, this generation will account for 40 per cent of all consumers. What’s interesting to me is that their motivations – and this already applies to slightly older luxury consumers, let’s say those already in their 20s – are really very different from those of my generation. To me, choosing a particularly high-quality brand or product is a personal statement, to do with my appreciation of the human investment in making that thing superior. These younger consumers are so acutely aware of their image, via social media, that so often their choice of brands and products is a political statement, rather than a personal one. A century of brand heritage might mean nothing to them. I suppose I should just say that I’m expecting to see more new, disruptive brands making inroads into the luxury sector. [Jan-Feb issue] Being a car guy at heart, I’d have to say our nine-page deep dive into the all-new Rolls-Royce Phantom limousine. And not only because it’s a bout a car, but because the Rolls-Royce embodies so much of what Robb Report is about. That said, I was also delighted by the story “Shear Magic”, that traces the journey of a bale of Australian wool to an Australian-owned wool processing plant in the Biella region of Italy – one of only three plants in Europe that supply the wool for dyeing, spinning and weaving into the cloths used by Europe’s most prestigious tailoring brands. Australia’s wool supply for Italian suits dates back more than a century. It’s a real education to read about it. What can readers expect from future issues of Robb Report? I’m going to assume that we’re doing our job well and will respond: “More of the same!” Whether it’s in travel experiences, watchmaking, jewellery, automotive, aviation, home design – it’s a commercial reality that innovations and bold detours tend to occur at the upper-luxury end, where inevitably higher costs can be absorbed within higher price tags. Happily for me and my fellow Robb Report readers, that means plenty of opportunities to nerd-out over new inventions, techniques and materials, and to hear from the innovators themselves. If Robb Report had a motto what would it be? “The Best of the Best”. It’s not only a long-running mantra of our parent Robb Report in the US, but an annual feature that, this year, celebrates its 30th anniversary. It’ll be the main feature in our July-August issue.